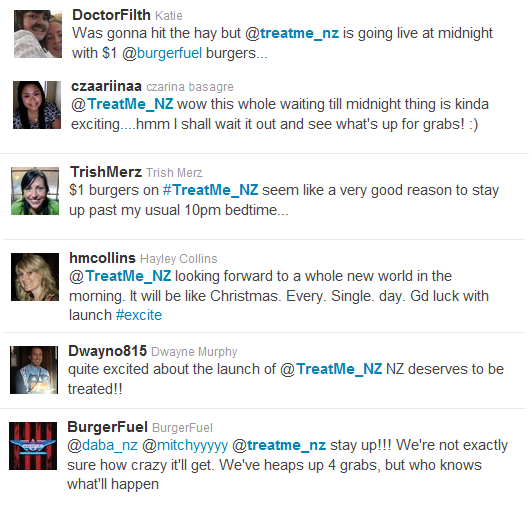 After having a big build up in the social media space prior to launch, they started getting a lot of feedback on Twitter and Facebook – remembering this is all happening at between 11pm and 1am, when most sane people are snugly tucked up in bed sleeping and not thinking about what’s for lunch or dinner tomorrow. There was a similar response on their Facebook page, with lots of unhappy customers. Their fan base grew from around 500 fans prior to midnight to over 1500 by the morning – although some full page advertising would have helped them along. How did your first purchase at TreatMe go? This entry was posted by AaronM on March 22, 2011 at 8:37 AM, and is filed under Uncategorized. Follow any responses to this post through RSS 2.0.Both comments and pings are currently closed.